Step by step guide and video tutorial on how to install the CloudExtend G Suite bundle (Admins only). We are pleased that you have decided to install CloudExtend G Suite for NetSuite. See this article for pre-requisites. We recommend that you schedule time for us to assist you with your trial set up. Please click here to schedule a time convenient for you. It should take approximately 30 minutes. To install the CloudExtend bundle click here. Once installed and the preferences are set, the CloudExtend bundle makes all the following four components available on your Account. The components are not yet active. You can activate all or some of the the components by creating trial licenses as described in the Activating Components section next. 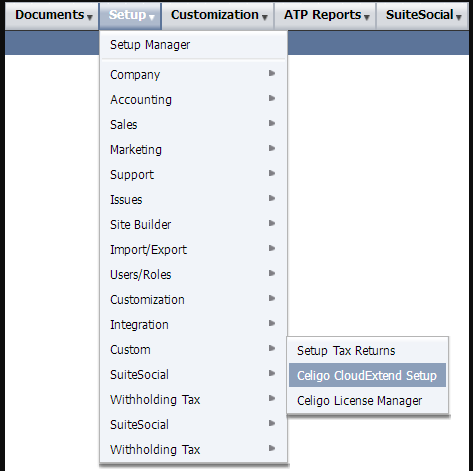 Once the steps listed in Installing the Bundle have been completed, you will find the Celigo License Manager under Setup > Custom. NetSuite’s menus are typically cached by the web browser and therefore the new License Menu may not be available immediately after installation. In which case, you can access the License Manager by going in to Setup > Setup Manager > Custom > Celigo License Manager. 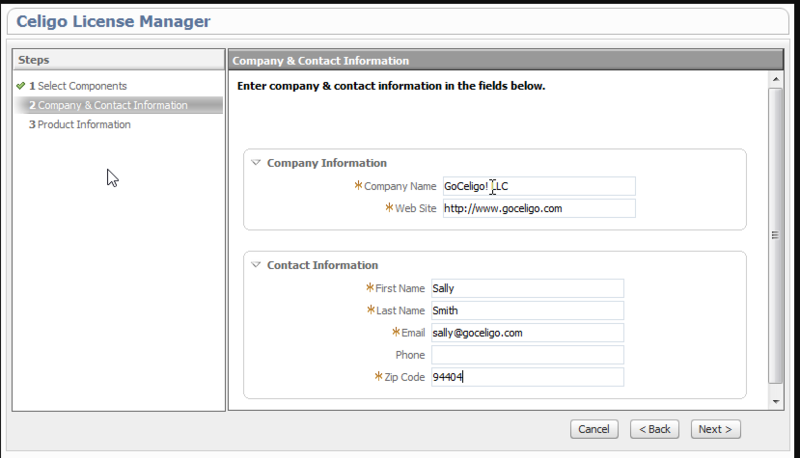 The Celigo License Manager provides you with a convenient interface for activating all Celigo products installed on your account. In order to activate CloudExtend or any of its components individually, start by clicking on the “Create Trial License” link next to the bundle or component. If you want to activate multiple CloudExtend components, the quickest way to do so is by creating a trial license for the CloudExtend bundle. When you do so, you will be prompted to select the components of CloudExtend you want to license. Below, we’ve chosen all. The next page prompts you for contact information about your company. Celigo uses this information to ensure that you get the best possible support during your product evaluation. 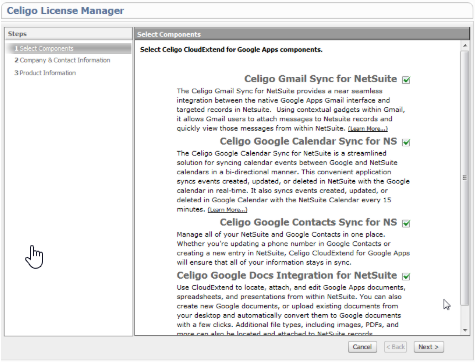 In the last step of the activation process, specify the Google Apps Domain, to be used with Celigo CloudExtend. IMPORTANT: DO NOT place “www.” in front of the domain. Use only our-domain.com, or our-domain.org, for example. Make sure you have Admin access to NetSuite and Super Admin access to the Google Apps account for your organization. If you do not have these credentials, you’ll either need to get them or the set-up must be done with the person who does have the credentials. The CloudExtend Setup Wizard guides you through the most important steps of installing and configuring CloudExtend. Before using the Wizard, please ensure that you have created licenses for the CloudExtend components that you wish to use. NOTE: The Configuration Wizard is launched immediately after setting up CloudExtend licenses through the Celigo License Manager. If you wish to re-launch the Configuration Wizard at a later time, go to Setup > Custom > Celigo CloudExtend Setup Wizard. Note: Calendar and OneWorld Settings are optional and will appear only if relevant to your account and license. Choose the relevant options to your account for the fields as pointed by arrows and click Next. You may click All to select/deselect all the employees for a particular product. Congratulations! You are done. Click Finish to go back to NetSuite. Once Administrator has finished the setup, the individual users will get an email specifying the User level steps. If you are licensed for Google Drive, you will need to install this additional CloudExtend component over your Google Apps account. To install the CloudExtend for Google Drive app, you will need to sign in to the Google Apps admin portal as a Super Admin. Make sure you are signed out of all other Google Accounts other than the one for which you need to enable CloudExtend for Google Drive. Make sure the following steps are performed by individual users of the CloudExtend for Gmail. These are NOT to be performed by the Administrator on behalf of the users. All end users will receive the below email once a license is allocated to them. They should download the extension by clicking the link in the email. That same link is displayed here. (Screenshot of a sample email below). Step 5(Optional): Enable TBA OR SSO based login. 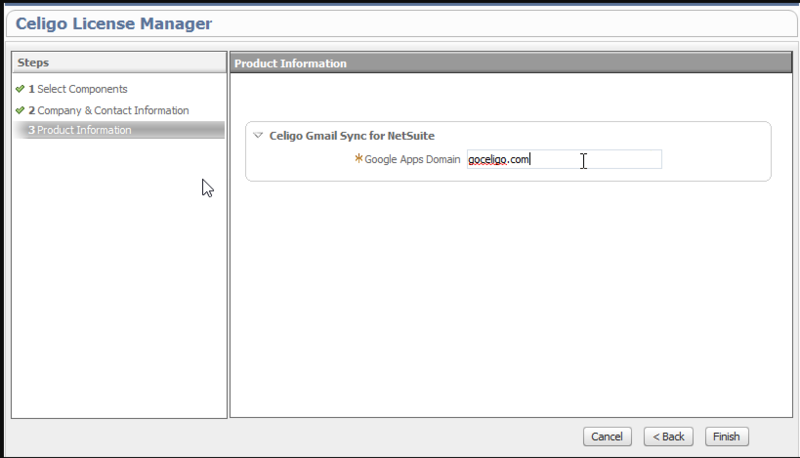 If your organization uses Google based Single Sign-on to login to NetSuite, your end users can use the same login to connect CloudExtend Gmail to NetSuite. Contact support using the chat icon in this page to enable SSO on CloudExtend Gmail. To set up Token Based Authentication (TBA) admins should follow the instructions in this article.